Haven Acres has been established to serve the youth of the Twin Cities and is located in Hampton, MN. The founders, Jason and Jenifer Heath, took in a teenage boy in 2002 that struggled with learning disabilities and mental health issues due to the abuse and neglect he had suffered as a child. The Heaths heard about a youth ranch in Oregon that used horses to help bring healing to kids with these types of issues, and when they searched for one nearby that could possibly assist the hurting teen they were raising, they were unable to find one in the area. The idea of someday running a similar ranch was conceived all those years ago and finally came to fruition in 2013. The program was developed by following the model of Crystal Peaks Youth Ranch. CPYR has developed a program that has been shown to be very effective, and hundreds of others have followed their example and reproduced similar ministries around the country. Haven Acres exists to rescue animals, serve youth and their families through mentorship, and demonstrate God’s love. 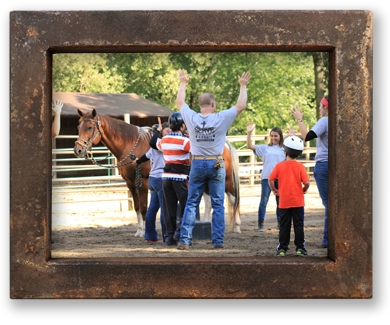 Haven Acres offers a safe, country environment where hurting youth find hope, healing, and restoration through their interaction with horses and loving mentors that exhibit the transformational love of Jesus. Though we are not associated with any particular denomination, we do hold tightly to the beliefs taught in the Holy Bible. We believe that there is only one God, and that He is sovereign over all. His Son, Jesus, came to the earth as a man, lived a sinless life, and took the punishment that we all deserve by dying on the cross for our sins. We believe that Jesus did not stay dead but rose from the grave on the third day and after walking and talking with his apostles for 40 days following His resurrection, He ascended back into heaven and is now sitting at the right hand of God the Father. We believe that Jesus is the only way a person can get to heaven and that by believing in Him and asking for forgiveness of our sins, we can be forgiven and live eternally with Him in heaven when our physical body dies. We believe in the Trinity, that God the Father, Jesus the Son, and the Holy Spirit are all parts of the ONE true God. We believe that the Holy Spirit has been sent to dwell in our hearts when we believe on Jesus and that He empowers us to live right, avoid sin and gives us boldness to share the love of God with others. Jason and Jenifer have been married since 1998 and have a total of 6 children, 3 girls and 3 boys. Jason works as a Financial Advisor for a large corporation and Jenifer worked as a Registered Nurse in Emergency Nursing for over 20 years, resigning from her position in order to volunteer full-time as Haven Acres’ Executive Program Director in 2015. In 2012, the Heaths were blessed with a 6.5 acre homestead that was set up for horses, and shortly after, God laid it on their hearts to use their property to help hurting kids and teens. Since then they have relocated to Hampton, MN where they were able to expand the program through a property with more acreage and an indoor riding arena. They have served their local church in the area of marriage ministry and have helped to run the Junior Bible Quiz program there as well. In addition, they helped raise and manage the care of a young man with learning disabilities and mental health issues which has given them a special desire to assist others on that path to find hope and healing. Holly Graffunder is a graduate from Moody Bible Institute with a Bachelors in Youth Ministry. She has been involved with Haven Acres since summer 2014, served as the intern in the summer and fall of 2016, and was a natural choice to add to the team as Assistant Program Director in 2017. She has always had a passion for God, a great concern for hurting people, and a love for horses. Holly was thrilled to find that Haven Acres is a ministry that has God at the center while using horses to offer healing and restoration. What a perfect fit! Paul has been a tax practitioner for ten years and recently merged his practice, Willis PSC, into the firm of Foreman & Airhart. Prior to his that, Paul had over twenty years of broad, international experience in a wide variety of industries and disciplines. Paul is committed to the highest standards of integrity and professionalism and is known for his ability to foresee and identify key trends impacting the success of each business’s operations. Paul is licensed as a CPA in Minnesota and Texas as well as being certified as a CMA. He received his MBA in Finance and International Business in Leuven, Belgium at the Katholieke Universiteit Leuven and his BBA in Accoundting from Abilene Christian University. Terry is married and has two wonderful daughters. He works in the IT industry and is employed by a large local health insurance company. Terry has been a member at a local church for 27 years. For the last 20 years he has volunteered with their Tech team, children’s ministry and one way café. Terry first started to volunteer at Haven Acres in the fall of 2013 doing chores and odd jobs. He moved to a maverick shortly after and has spent the last few years as a mentor. He also enjoys helping with chores year round. Besides Haven Acres, Terry’s interests and hobbies include spending time with family, volunteering with the local high school marching band and gymnastics team, and running. Eddie has been working at a public utility company since 2003 and in 2012 became a Purchasing Specialist for them. He is married with two wonderful boys. One son works for a large zoo in south Texas, while the younger one continues to follow his passion for dance in Oklahoma. Eddie ran little camps for kids in Kansas who were physically challenged assisting them in having their own Special Olympics in the mid-70s. In addition, he has actively served in the children’s ministry at his local church since 2008. He enjoys being around kids because it makes him feel young. Mike Lubinski has worked as an engineer for a Fortune 500 company since 1984 and has a keen mind for business and numbers. He and his wife, Mary, have been married since 1983 and have 3 adult children. Jay, one of their sons, unfortunately lost a courageous battle with brain cancer in 2013 at the age of 21, but that tragedy has only served to strengthen their faith and determination to help other kids and families who need extra support during difficult times. Serving as Children’s Pastor for a local church since 2008, Mary has a heart for kids and has a special gift for making them feel valued and loved. Mike and Mary have chosen to serve on the Haven Acres Board of Directors as another avenue to invest in the youth of their community.